The Engagement Survey measures the level of engagement between an individual and his or her job and also to their employer. Research by Gallup shows that engaged employees are more productive employees. They are more profitable, more customer-focused, safer, and more likely to withstand temptations to leave the organisation. 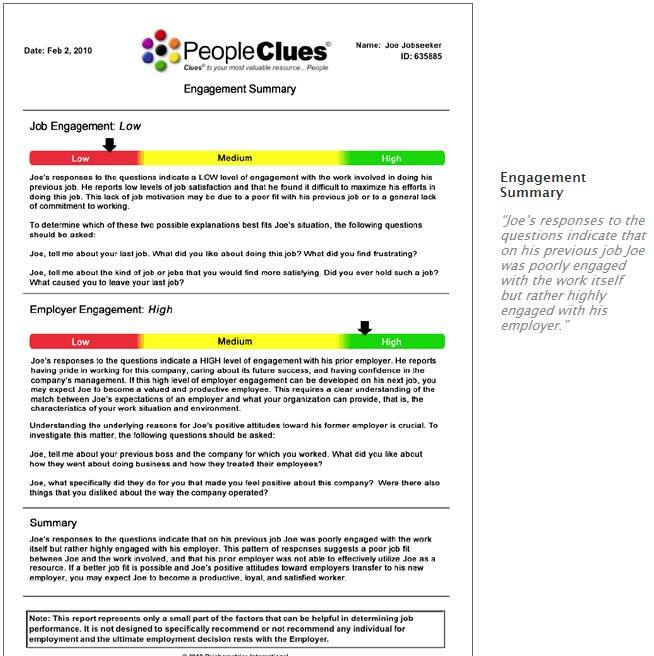 The PCEvaluate Employee Engagement Survey can be used in the recruitment process to help Recruiters, Hiring Managers and HR Professionals to understand a candidate’s level of commitment and engagement with their current or most recent job and employer. If a candidate indicates that they have a low level of commitment with their current or most recent job, the risk of hiring them is higher because you have to determine “if” they can be motivated to work in your open position. If you know that a candidate has a low level of commitment to their current or most recent employer, how do you know if you can motivate them to work for your company? Uses a graph with Low, Medium or High to show the level of engagement to job and also to the employer. Dynamically generated interview questions are also included along with a summary statement. The Engagement assessment measures the engagement between an individual and his or her job and also to their employer.